V. V. Molotok and V. V. Kludzin are with the St. Petersburg Academy of Aerospace Instrumentation, St. Petersburg, Russia. 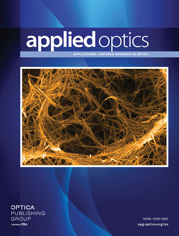 Acousto-optic (AO) devices are important spatial light modulators. They can be used as light-beam deflectors, rf true-time-delay lines, etc. To increase their spur-free dynamic range, we present what to our knowledge is a novel multichannel AO device structure, in which different channels have different carrier frequencies, so a wideband signal can automatically be decomposed into a set of narrow-band signals. Design, fabrication, and testing of this 24-channel, 10-μs AO spatial light modulator are addressed.